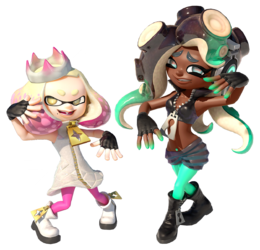 Off the Hook (テンタクルズ Tentacles) is a pop idol duo based in Inkopolis Square consisting of Pearl and Marina. They take over the Squid Sisters' duties from the first game as the hostesses of Inkopolis News at the start of the game, as well as Splatfest events. When the game starts up the first time in the 3.1.0. update, Pearl will put an Inkopolis Fashion Focus about a trend of "squidkids with weird hairstyles", which are actually Octolings. As the broadcast ends, Pearl says that that was the only best thing so she will probably never do it again. Off the Hook makes an appearance throughout the Octo Expansion, helping Agent 8 and Cap'n Cuttlefish by giving advice and commentary on Agent 8's tests. They meet the duo after Agent 8 passes Fake Plastic Station through Cap'n Cuttlefish's walkie-talkie, as they were on Mount Nantai where the signal was the strongest. Pearl and Marina call themselves by their usernames, MC.Princess and DJ_Hyperfresh, respectively. If Agent 8 loses all of their lives in a test at least twice, Marina will offer to use Agent 8's test data and hack the Kamabo Corporation's database to trick the test into thinking Agent 8 passed. If Agent 8 has less than 2000 CQ Points to do so, Pearl will take money from her dad's wallet to be transferred into CQ Points, after which Cap'n Cuttlefish can be talked to to pay the points back. After Agent 8 collects all four thangs, Marina discovers they make a blender and the Telephone that had them find the thangs intends on blending Agent 8 and Cap'n Cuttlefish. Before it can do so, however, Marina activates Agent 8's CQ-80's distress signal, summoning Agent 3 and breaking the blender and phone in the nick of time. Marina then tells Agent 8 that they can escape through the hole Agent 3 made. As Agent 8 escapes the facility, Off the Hook shows up with a fleet of helicopters to pick them up along with Cap'n Cuttlefish and Agent 3. As Pearl raps with Cap'n Cuttlefish, the platform Agent 8 was on rises up and turns out to be a huge statue of a human, with the Telephone, now known as Commander Tartar, intending on destroying all Inklings and Octolings with his blast of primordial ooze. Marina analyzes the statue and discovers that the statue is charging up by sunlight. Therefore, if they can cover it with ink, with the help of her Hyperbombs that Agent 8 has to manually detonate, then the statue will stop charging and Pearl can finish it off with a "Hypersonic Battlecry" to destroy it. After Agent 8 detonates all the Hyperbombs, the statue attempts to fire anyway, prompting Pearl to activate a giant Killer Wail stylized with her colors and crown. As the statue fires, Pearl lets out a giant Booyah and battles with the statue's blast before pushing it back and destroying the statue with pink ink. As the statue collapses into the sea, Pearl and Marina celebrate and watch the credits with their allies. On 10 February 2018, Off the Hook had their real-life debut in a concert called "Haikaraibu" (Japanese: ハイカライブ, translating to "Inkopolis Live"), held at Tokaigi 2018. They performed all of their songs except for "Fest Zest". New lyrics were also featured for most of their songs. They also collaborated with the Squid Sisters for the final song, "Now or Never!". On 31 March 2018, at the Splatoon European Championships at Polymanga in Switzerland, a second Splatoon 2 virtual concert was held, as the first one outside of Japan. It was an English version of the previous concert at Tokaigi 2018. On 28 April 2018, another "Haikaraibu" concert was held at Chokaigi 2018. Their song Nasty Majesty was performed live for the very first time. A fourth concert, titled "Off the Hook Live" (Japanese: テンタライブ Tentaraibu), was held at Tokaigi 2019 on 26 January 2019. It was the first concert featuring only Pearl and Marina. It featured more songs from the Octo Expansion in addition to their original songs. Off the Hook's Dutch, French, German, and Italian names resemble the English name for the Pokémon Tentacool. Pearl and Marina share similarities with, and have similar designs to, the Squid Sisters. They all have beauty marks. They all wear gloves. The Squid Sisters wear white gloves and Off the Hook wear black fingerless gloves. They all wear tights consisting of their main colors. Pearl and Marie have light-colored tentacles, and Marina and Callie have dark tentacles. Pearl and Callie have a pink color scheme as Marie has a green color scheme and Marina's color scheme is teal (a combination of blue and green). Pearl and Marie wear a dress, and Marina and Callie's outfits consist of shorts. Pearl has golden eyes with plus-shaped pupils and Marina has eyelashes like the Squid Sisters. They are both expressive and excitable like Callie, and sassy and sarcastic like Marie. Marina has a chat room, similar to how Callie has a web blog. In their Japanese text, Pearl and Callie extend syllables with ー, while Marie and Marina extend syllables with ～. Marina and Callie are more noticeably kindhearted compared to their co-host. Marina's voice clips are similar to Callie's. Callie and Marie's first song, Calamari Inkantation brought them success, similar to how Pearl and Marina's first recording of Ebb & Flow brought them theirs. In contrast to the Squid Sisters, Off the Hook produces their own songs. The holes in their zippers are the shapes as their eye pupils, and the zippers are the same colors as their eyes. In the liner notes that come with Splatune 2, Pearl's lyrics are rendered in hiragana, while Marina's lyrics are in katakana. In an interview with Famitsu, Toru Minegishi says that this is because Marina sings in a different in-universe language. This is consistent with DJ Octavio's in-game text and some of Marina's own text during Inkopolis News, making it seem her text is said part in Inkling language, and part in Octarian. Pearl and Marina's outfits in the Octo Expansion resemble those worn by late rappers The Notorious B.I.G. and Tupac Shakur, respectively. A previously unheard Off The Hook song (Nasty Majesty) was used as the music for the Nintendo Direct preview for the Octo Expansion. When looking at them long enough while zooming in Inkopolis Square, Marina will wave at the player with Pearl glaring before smiling with a pose. When the player looks at them long enough while as an Octoling, Pearl will notice them first and both she and Marina will notice that they are Agent 8 from the Octo Expansion. Both of them will give the player a determined pose instead. The Octo Expansion reveals that Ebb & Flow was Off the Hook's first song, and there are three reiterations of it in the Expansion. Marina made a demo tape by herself with a half-broken keyboard on Mount Nantai before she met Pearl. An "Octo" re-recording of the chorus (with some different lyrics) plays when there is one minute left on Turf War on the NILS Statue. A choral version of it plays when Commander Tartar is destroyed and Inkopolis is saved at the ending. The Octo Expansion also reveals that until the events of the Expansion, Pearl was unaware of Marina's true nature as a former member of the Octarian army. After being informed by Cap'n Cuttlefish, she remains protective of her bandmate, and reassures Marina that everyone will still love her. The opening banter for the Squid vs. Octopus Splatfest still has Pearl unaware of Marina's true nature, suggesting that the Splatfest takes place before (or concurrently with) the Expansion's events. The "Bonus Track" chat log in the Octo Expansion reveals that Pearl had pulled an all-nighter for "the Splatfest" not long ago, supporting this theory. It could also mean she is feigning ignorance for Marina's sake. It was at first believed that Off the Hook would join the Deep Sea Metro at some point in the Octo Expansion or upon completing it as seen in the trailer, until this is proven wrong as they only make a physical appearance during the final Boss. When Off the Hook perform their catchphrase and pose in-game, it sounds exactly like they are saying their catchphrase in Japanese (Nuritakūru... Tentakuru!!). Nuritakūru... Tentakuru!! Ink it up... Tentacle!! Dutch Hou je cool, hou je TENTACOOL! Keep yourself cool, keep yourself TENTACOOL! Italian Non ci resci con le mani? Allora tenta coi tentacoli! You can't do it with your hands? Then try with the tentacles! Russian Ни крючка ни сачка! Ni kryuchka ni sachka! Neither a hook nor a net! Mantenham-se fresquinhos! [note 3] We hope you have a sweet tooth, because it's not gonna be a cakewalk. ↑ Onda has multiple meanings in Latin American slang. Its meaning here may have to do with being trendy. This page has been accessed 227,718 times.